Wall Street looks set to continue a record-setting climb to end the week, with all eyes on the key jobs report. 1. Economic data to watch: Investors will be watching as May's jobs report come out at 8:30 a.m. ET. Economists surveyed by CNNMoney expect that 200,000 jobs were created in May, down from 288,000 in April. "Today we get a chance to see how many jobs have been added to the economy and there's a good deal of hope that we're going to be north of 200,000," said Art Hogan, chief market strategist for Wunderlich Securities, who forecasts a gain of 253,000. As long as at least 113,000 jobs were created, the U.S. will have now finally recovered all the jobs lost in the financial crisis. Still, most Americans think the economy won't fully recover for years. 2. 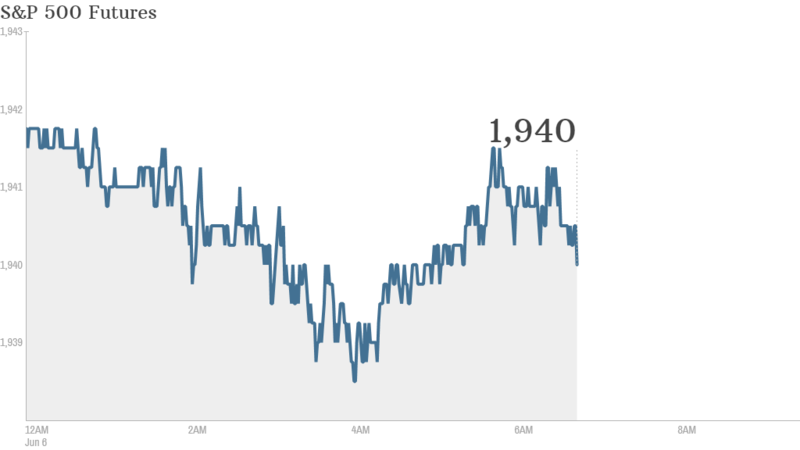 Markets look poised to keep edging up: U.S. stock futures were tilting higher Friday, after markets shattered records when the European Central Bank unleashed negative interest rates to fuel growth. The Dow Jones industrial average and the S&P 500 gained about 0.6% to all time highs. The Nasdaq followed suit, adding 1.26%, while the small-cap Russell 2000 surged almost 2%. "We've settled into the realization that we've got an economy that is recovering, albeit slowly, and the second quarter is shaping up better than the first," said Hogan. 3. Stocks to watch: Bank of America (BAC) may have a rocky day -- it is edging down 1% ahead of the open, after government sources said that the bank was negotiating a deal with the Justice Department that could lead to a $12 billion settlement related to the bank's mortgage banking practices. It's also worth keeping an eye on Credit Suisse (CS) and Facebook (FB) today -- both are among the top 10 most active during pre-market trading on the Nasdaq. 4. International markets: European markets jumped in midday trading, led by a 1.3% rise in Spain, as the ECB's stimulus package continued to bolster appetite for riskier assets. London's FTSE 100 climbed 0.4%. The euro slipped 0.1% against the dollar. Most Asian markets closed in the red, with Hong Kong's Hang Seng losing 0.7% and China's Shanghai Composite dropped 0.5%. Japan's Nikkei was little changed. India's Sensex rose 1.5%.